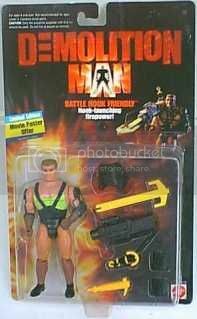 Hopefully everyone has seen the 1993 Sylvester Stallone film Demolition Man and enjoyed it thoroughly. 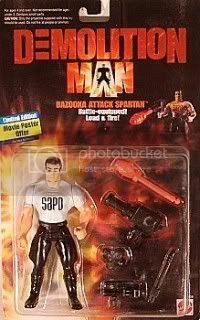 Some may not know of the action figure line that was released to coincide with the film. The line is small and is relatively easy to find althought the Simon Phoenix and Edgar Friendly figures are harder to track down. 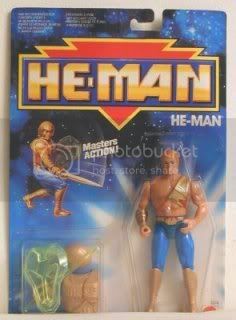 The line had the luxury of being able to use the molds from the New Adventures of He-Man figures to use for their own line. 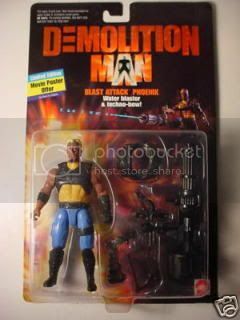 Here are the comparisons to see the original New Adventures of He-Man figures and the Demolition Man re-used molds. After those bodies were re-used they also did do original body casts for other figures. 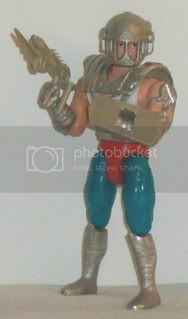 They are easy to tell the difference from the He-Man originals as they have straight legs where the He-Man ones had a knee joint. 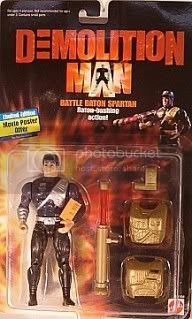 There were in total 4 John Spartan figures, 2 Simon Phoenix's, 1 Edgar Friendly and 1 Cryo Claw Technician in the set. 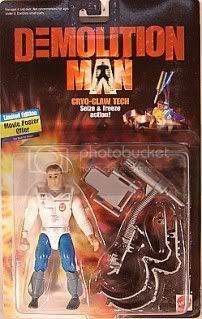 As I stated before the Edgar Friendly and Simon Phoenix figures are harder to track down with the Cryo Claw Technician not as hard but the John Spartan figures are relatively easy in comparison. 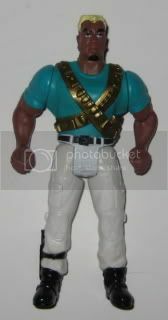 Sadly the line either did not sell well or the contratct ran out as they never released a Lenina Huxley, Dr. Raymond Cocteau, Alfredo Garcia, Zachary Lamb, Warden William Smithers or any of Simon Phoenix's thugs as figures of their own. This line is not an expensive line to complete and is small enough that tracking all of them down will not take a lot of time. 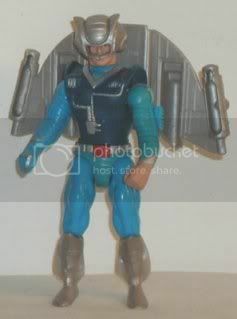 There were other items released that went with the figures like the Bola-Jet but there wasn't a playset which they could have done based on the Cryo Prison, the Museum or even the Police Station. This line had so much promise and could have been extended much like the Aliens, Robocop and Terminator figure lines. Going against it was the fact it never became a tv show or had sequels like the aforementined films did. At this time I know of no prototypes or variants that would have been a second series. 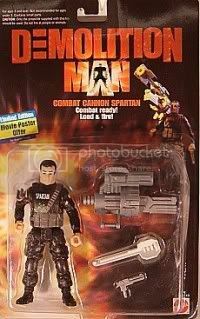 In this regard it is similar to two other lines I collect, Last Action Hero and Super Mario Bros. Movie figures. Very small lines based on movies I enjoyed. It goes to show that sometimes a great film and excellent figures will not always be a sure fire measure for success. 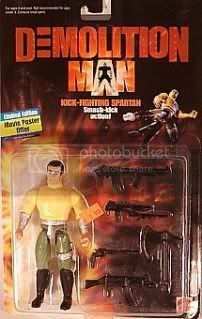 Unlike the Rambo and Rocky figures this is one line of Stallone figures that didn't become big sellers and in this regard they are like Arnold Schwarzenegger's Last Action Hero figures compared to the success of the Terminator series of figures. In closing I would have to say go out and track these gems down. You will not be anything but happy to have these figures in your collection. It is rare for an official line to use molds from an altogether different franchise as the base for several of it's principal characters. 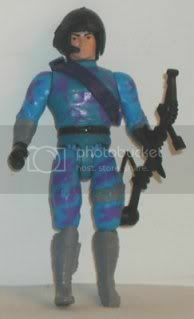 I believe the first Simon Phoenix figure is a repaint of Visarr from New Adventures of he-Man. Just a slight mistake but rectified now. Sorry.